The house comprises of 5 double bedrooms. There are 3 Twin bedrooms, one bedroom featuring 2 Queen beds, and another Queen bedroom. All bedrooms include rustic furniture to keep the traditional Ibicencan style and ensure a pleasant stay. There are 3 bathrooms in the house. All of them include shower, bath, toilet, sinks, mirrors and toiletries. Towels and toilet paper are provided by the owners. Downstairs there is a well equipped rustic kitchen with wooden furniture comprising of stove, coffee maker, dining table, toaster, microwave, oven, fridge and a garden table. The villa has a large entrance with a white dining table ideal placed in front of a lovely chimney. There is also another sitting area decorated with many antiques, TV, DVD player and stereo. The property benefits from chilling out areas with seats and tables, swimming pool, large terraces and beautiful gardens. There is a general cleaning offered the day of arrival, and another one at the checkout. There is air conditioning in the house, big terraces, sunbeds, "Al Fresco" dining areas and absolute peace and privacy. Big pets are not allowed in the villa. Our villa benefits from superb views over the well-known San Antonio bay facing the blue bright Mediterranean Sea, where you will relax and see striking sunsets in the evening, known all around the world for being magic and extremely beautiful. This villa has been built carefully and decorated by its owners over the last 10 years. Every detail has been wisely selected paying great attention to the style of the furniture, from the cool ?Valencia Cream? marble floors to the handcrafted Iroko doors. This renovated finca is set in the quiet countryside in the heart of the island, surrounded by beautiful gardens. Being close to Santa Gertrudis, Ibiza town and Santa Eulalia it offers a great choice of leisure and restaurants near by. 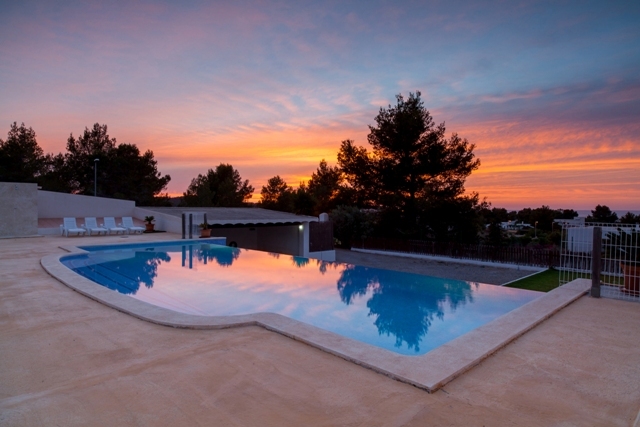 With 5 bedrooms, various chill out zones and covered BBQ area with big outside dining table it is perfect for families and group of friends to enjoy all the aspects of holidays in Ibiza.